PLCS Flex-Kit is an encapsulation repair system that utilizes a flexible semi-rigid fabric mold for remote installation through a vacuum excavated keyhole. For over 15 years the Flex-Kit has proven to be the most efficient and economical combination for the permanent repair of leaking bell joints . 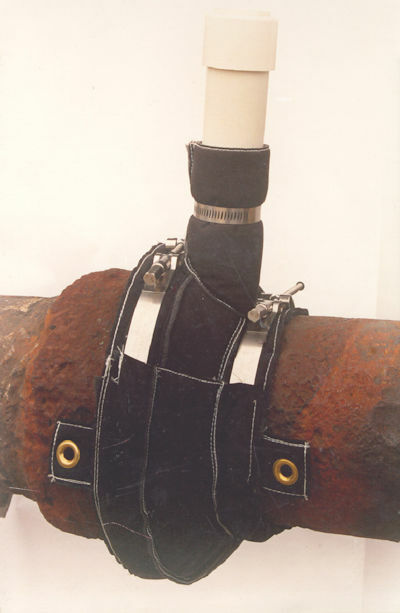 A proven remote bell joint repair system. Disposable structured fabric mold with integral steel fastening system. Available for 3" to 12" LP Bell Joint repair. Each kit includes an easy to apply primer application system. The kit is Installed with economical long-handled tools. One-step pressurization cap with its integral piston. As a result of the structure of the mold, backfill can be immediate if a little care is taken. Training: PLCS field technicians are available for on-site instruction and supervision. Discover PLCS Encapsulation & its Unique Advantages: Other PLCS data sheets cover repairing almost any kind of joint or fitting with encapsulation at pressures up to 60 psig.